QuickOffice is a built in Microsoft Office Client in Symbian Nokia devices and some other smartphones. Usually an OEM version of QuickOffice is shipped with these devices. However, there is an advanced version of QuickOffice that can be used to do various operations which cannot be done with the OEM version. 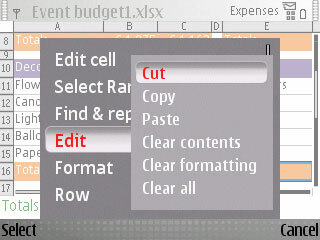 QuickOffice 6, the latest software can be used to edit, view and create Office 20007 documents in Symbian mobile phones. 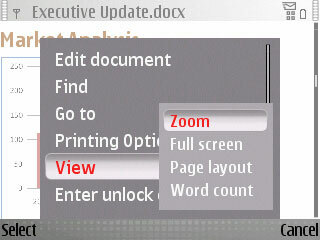 As you expect in a mobile office client, QuickOffice lets you open all Microsoft Office 20120 documents on your handset. The latest product QuickOffice 6 premier adds DOCX, XLSX file compatibility along with the old Office 2003 formats. Create new Word, PowerPoint or Excel file from scratch. Open attached documents in mail and websites. Improved tools for graphical editing and mathematics calculations. QuickOffice 6- Microsoft Office Word on Mobile. 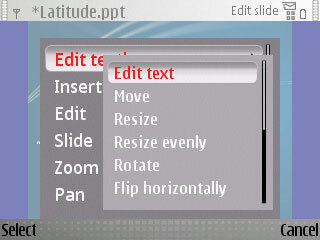 QuickOffice 6- PowerPoint Mobile interface. QuickOffice supports S60 V3 (Nokia, Sony Ericsson, Samsung, LG), S60V5 mobile platforms. QuickOffice is now available for iOS, Android, BlackBerry and other OS platforms. You can buy the software from corresponding app stores. Update: QuickOffice 6 mobile for Symbian has been renamed to QuickOffice premier. You can download the latest version here. i need quick office free download links…with new verstion .